started experiencing issues with nitrification. 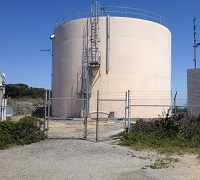 To combat the issue, San Bruno drained their tanks in the excess of 60,000 gallons every two weeks and sent out a crew of 4-5 to flush water in this entire pressure zone. Seeking a way to reduce the cost and manpower associated with nitrification, San Bruno worked with PAX Water Technologies to trial the newly developed Residual Control System (RCS).